Fifty years ago, Olympia Press in Paris issued a book that redefined not just American literature, but American culture. 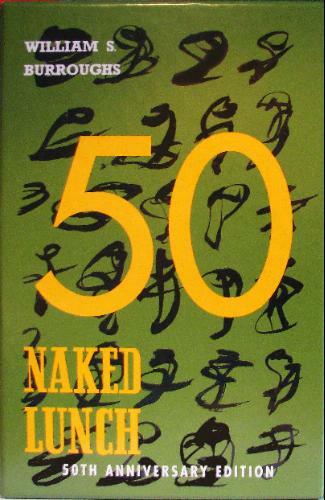 Naked Lunch, the U.S. edition of which soon followed from Grove Press, is one of the most important and influential novels of the twentieth century. An unnerving tale of an addict unmoored in New York, Tangier, and ultimately a nightmarish wasteland known as Interzone, Naked Lunch’s formal innovation, formerly taboo subject matter, and tour de force execution has exerted its influence on the works of authors like Thomas Pynchon, J. G. Ballard, and William Gibson; on the relationship of art and obscenity; and on the shape of music, film, and media in general.On the fiftieth anniversary of its first publication, Grove Press is proud to issue a special slipcased hardcover edition featuring the restored text, faithful to Burroughs’s original composition, as well as an insightful afterword by David Ulin, book editor of the Los Angeles Times. This entry was posted in Books by Fluxion Editor. Bookmark the permalink.